and it was that new train of thought which lead me to the theme of this giveaway. my daily life, which is where I thought you guys would come in handy - more ideas! you all are just chock full of ideas that I have yet to fathom. How do I get in on this giveaway? Create a blog post with 5 things you do right now that can be considered eco-friendly. In that same post come up with 5 things that you don't do, but could easily start doing. And in the spirit of 'sharing the love', nominate one of your environmentally conscious comrades to be entered for their chance to win one of the giveaway items, too! Any person participating by blogging about their '10 things' will receive 3 entries. Anyone who is nomined will receive 1 entry in the giveaway. Three winners will be chosen by drawing names. One prize will be awarded per person. The giveaway will close SUNDAY 12am. Add your name & link to Mr. Linky once you've blogged about your '10 things'. - I filter my own water and refill a reusable bottle to eliminate my water bottle waste. -We have replaced all of our bulbs with CFL's (compact florescent bulbs). -Reduce water usage by taking no more than 3 showers a week (it's not really a sacrifice for me). -Of course we recycle paper, plastic (#1 & 2), and glass. -I hang dry the majority of my clothes to cut back on energy used by the dryer. It also keeps them intact longer. -Composting. The bulk of our trash (which consists of very little - 1 bag every two weeks) comes from organic waste, which could be reduced even further by composting. -Take one of our own containers to restaurants for left overs instead of their disposable option. -Get our toilet leak fixed. -Find better alternatives to household cleaning chemicals. -Reduce plastic waste even further, by buying less items that come in containers. Fun giveaway. I'll have to do my post this week. I like your lists, especially since it reminds me that the maintenance guys forgot to check out my toilet leak today, LOL. I am very water conscious due to the drought and lack of water in our dams, I could be a better recycler. Huge issue for me. Mike is home this week on vacation so I may not have time to compose a post for the giveaway. I actually have been planning on blogging about an eco-related post written by another blogger who had excellent ideas. 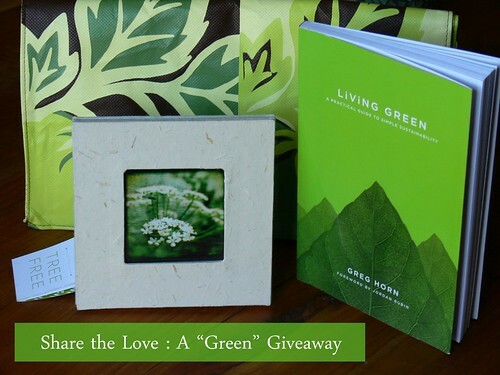 "And in the spirit of 'sharing the love', nominate one of your environmentally conscious comrades to be entered for their chance to win one of the giveaway items, too!" I am not sure whether I can nominate anyone I know in the blogsphere yet? I think the CFL's are becoming more and more prominent and soon they will replace normal light bulbs for most people. I notice every time I am at the grocery store they have them on sale and displayed all over the store! Taking your own container to a restaurant is a great idea! I never thought of that! Wow, you're making us work. Not sure that I'll join since I have some other posts in the works this week. Thanks for encouraging us all to be more mindful. J.H. - Let's keep it between blogs, just so we can communicate and meet new people. Great ideas. This is something that is important to me but I just do not do enough of. You inspired me and I will be thinking of a list. I was inspired to be greener & post macro shots with tons of bokeh! I'd like to nominate Cathy as a great greenie... she has great eco friendly posts, I think weekly. my life is all sorts of topsy turvy right now so i am taking a break from posting on my blog but i did want to pop in real quick about being green. i'm slowly, slowly, slowly doing what *i* can be greener. 1. i make and use my own laundry detergent. 5. i don't use commercially made cleaning chemicals, i make my own for home use. i know there is more i could be doing but i'm getting there! she's the one who introduced me to the homemade detergent. I'm so bummed I miss this post! I like your idea of bring your own containers to a restaurant. I need to do that and bring my own coffee cup into Starbucks, etc. I feel so guilty about using disposable cups. Ok, I took the bait. Those prizes look pretty. Thanks for bringing this up! I've blogged about it. Hi! Thanks for finding my blog! Your entries are really interesting...I'll come back again! thanks for the challenge, jessica! Thanks for doing this; it helped me to think about the things that I can do I better. I posted my 10 and nominated someone on my blog. Thanks for motivating me to finally getting around to post. I've been overwhelmed on so many different fronts as of late. Your site always brings encouragement. yay - that was fun to think about - my post is up. I really like what I read. I recently started my own blog and now look for other like-minded folks.
. figure out a way to use less paper at work, even with recycling it still seems like a waste.
. remember to turn off the TV when I am not in the room.
. reminding myself that a large bag of chips is better for the environment that a lot of small individual serving packages.
. a t-shirt, a pair of underwear and a pair of socks is NOT a load of laundry.
. buying stuff in bulk and letting it go out of day on the shelf is not a great way to safe money or protect the environment. Coming up with the 5 thing I do was easy but pointing out the five thing that I need to improve or correct was hard. Now that I have pointed them out to myself means I have a chance to fix them as well. I had a lot of fun looking at everyone's eco-friendly aspirations. Good luck! I agree with thom that is was really easy to name the things I do now that are eco-friendly but coming up with 5 things to improve upon was quite hard. Thanks for getting us all thinking. Great blog and I'm glad you motivated me to write about going "green." I am enjoying reading how other people do their share and I plan to use those ideas! oh darn .. I think I'm too late.